Milestone birthdays, special anniversaries, graduations, family reunions: all sorts of special occasions call for special celebrations, and sometimes a destination vacation is the best way to celebrate. Our 4-bedroom vacation rentals in North Tahoe area offer room for small groups to get together and celebrate their specialness without breaking the bank. These homes are reasonably priced and offer luxury amenities you can’t get in a sterile and cramped hotel room. So, if you are looking to celebrate that next great event in your life, or even if you’re just looking to get away with a group of your favorite people to celebrate Tuesday, why not check out what our 4-bedroom North Tahoe vacation rentals have to offer? Turn the key and take a minute as the door swings open; this is going to be your home for the next few days or so, and the warmth of the rustic cabin will envelope you. 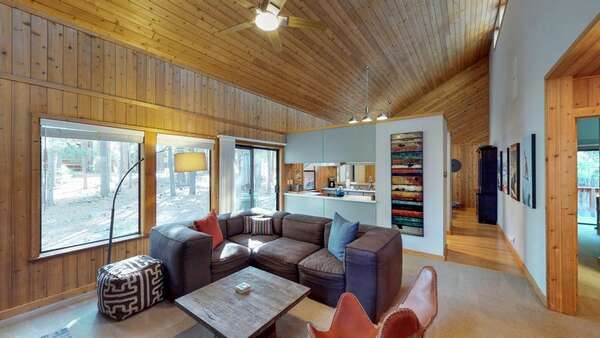 From the vaulted ceilings paneled in wood to the tiled and carpeted floor beneath your feet, these 4-bedroom North Tahoe vacation rentals are meant for family. Living areas with stone fireplaces protect against chills, while comfortable couches and chairs provide soft places to read a book, chat with your family, or simply to stare out on the million-dollar views available outside your window. The kitchens are the heart of our vacation rentals in North Tahoe, perfect for creating a feast for the entire group or for late night heart to hearts over cookies and cocoa; the high-end appliances will make the feast making even easier! Dining areas contain sturdy tables and chairs that can be used for puzzles and games as well as enjoying the meals prepared in the kitchen. The bedrooms offer cloud-soft beds in rooms that are designed to ensure every night is a peaceful one. Hot tubs on the decks, jacuzzi tubs in the bathrooms, and more of those views mean family time will be made even more special in a Tahoe Signature Properties 4-bedroom vacation rental! No matter what the season, you and your group will always find something fun to do near our North Tahoe vacation rentals. Peruse the Farmer’s Market in South Tahoe for fresh fruits and veggies to serve to your family or for souvenirs to bring back home. Picnics at the lake, tours of the Gatekeepers Museum, afternoons spent at the KidZone Museum: This family vacation in the heart of Tahoe will change your life. So we know about skiing, ice skating, and snowboarding, but what about snowmobiling? This is the next hot thing in the world of winter sports. If you have done cross-country skiing before, you’d appreciate snowmobiling. It follows the same concept, giving you that rare sense of freedom you only get when facing snow-clad nature all by yourself—only snowmobiling is faster and allows you to cover a lot of ground in a short period of time and with a fraction of the effort that cross-country skiing requires. If that sounds like your kind of adventure, buckle up, because your sled is ready, and the thrill of your life is only one turn of a key in the ignition away. Back in the 80s, arcades were all the rage. If you spent your childhood in front of those machines conquering galaxies and winning bike races, now is your chance to relive those blissful moments again, because believe it or not, arcades are alive and well near our North Tahoe vacation rentals. A few of the casinos in the area offer all kinds of arcades that will take you back in time to when life was simple and you could sit for hours on end playing without getting bored or even feel the passing of time. Tahoe Biltmore Casino has a select choice of arcades as well as live events and fine dining. Bowl Incline also has a section dedicated to arcades that every enthusiast of retro gaming should try out. So this is just a different name for cross-country skiing. This sport used to be the only way of transportation in Scandinavia during the winter. And yes, many people still prefer this old-fashioned way of traveling and exploring the winter wilderness over snowmobiling. You’ll need a special set of equipment which in general is sturdier than that used for downhill skiing. Also, watch for the trail and don’t wander off on your own. There are many cottages along the way where you can get warm and take a break from your demanding sport before heading back to one of our North Tahoe vacation rentals. The Historical Society has everything you need to know about the history of Lake Tahoe. However since they don’t offer historical tours, you can look elsewhere for guidance. Mark the Thunderbird Lake Tahoe on your map and head there one fine morning. Waiting for you will be the Thunderbird Lodge and the Thunderbird yacht. Tours of the lodge are available from Tuesday to Saturday between the months of May and October. The yacht is on the east shore of Lake Tahoe. Reserve Your 4-bedroom Vacation Rental Today! Special occasions are made more special when spent in Tahoe—start planning and reserve your vacation rentals in North Tahoe today!